I'm about to order some material here in Israel, and the plastic company we work with didn't have ABS but they recommended polypropylene. They said it had a melting point of about 100 degrees celsius (I think they were slightly off here). So I was a little dismayed but I went on a little search and found that wikipedia listed the melting point as "~160c"
I'd be very wary about ordering a bunch of polypropylene. I was able to extrude it using a modified Mk II extruder, but not reliably enough that I could ever do any serious printing with it. Mind, I was using homopolypropylene, which has a particularly high barrel pressure requirement. That's about right. It doesn't, however, extrude easily until you are quite a bit hotter than that. I frankly think that you'd be making a mistake unless you are committed to figuring out how to extrude polypropylene and wouldn't mind spending a lot of money finding out. I've been working with HDPE that way, mind, but I still haven't got acceptable results with that plastic. The ides data is for injection moulding which is quite different. I have found you need to extrude at around twice the melting point minus the temperature of the layer below in order to form a weld. For big objects that would mean about 300C for PP unless you heated the bed. I am not sure whether it would start to decompose at that temperature. Probably better to heat the bed to about 60C and extrude at 240C. Still it needs somebody to try it to be sure. PP should be good for making flexible things like living hinges. > making flexible things like living hinges. I'm attracted to it for much the same reason. It's also the cheapest regularly available polymer out there. Thanks guys, the most help is knowing that PP is not the holy grail they were toting it to be. I will be needing something to test my extruder when it's ready anyway, so I think i'll call them up and ask for a sample of the plastics they have. (they also carry PE). After some tests I should be able to find out if something stands out as easiest to use. This is as far as I have got with PP. Printed on to a PP base with no raft, temperatures were up at 240DegC. Wow! So what kind of extruder are you using? All the recent parts have been produced using a BfB extruder with the twin motors, the same one you commented on when I posted the video clip of the working machine. The extruder has remained more or less unchanged. I have changed the hot end a couple of times to get a more consistent filament. The final version has now been in use for many hours of printing being very reliable and giving a consistent print quality. If there is interest I will blog a few details on what works and what does not on the BfB design. Either way any experience I have had on the BfB design has been fed back to them to assess for future versions. To be honest I did not post anything on PP as the results are poor compared to PLA (pic attached)and PCL prints. I have only had a couple of hours printing with PP, its not the easiest material to work with. The small PP board I used to print on was a mess by the end of testing, it had so many bits of PP welded into the surface it was hard to find a flat bit to continue testing! When I did arrive at a good setup the resulting print was very strong and durable, however, the surface finish of the object was not so good. The kids have several large boxes of sweets for Christmas, all in nice PP containers with large round and flat PP lids. I already organized for them to come my way when they polish off the contents! Edited 1 time(s). Last edit at 12/24/2008 10:51AM by tofletcher. So how many hours of printing did you do with polypropylene? That is foolish. ANY results are important. Till you just said, I didn't know that anybody had even TRIED to print with polypropylene, much less managed to do so successfully! Just looking at your pics it looks like you are needing to be running a bit hotter. 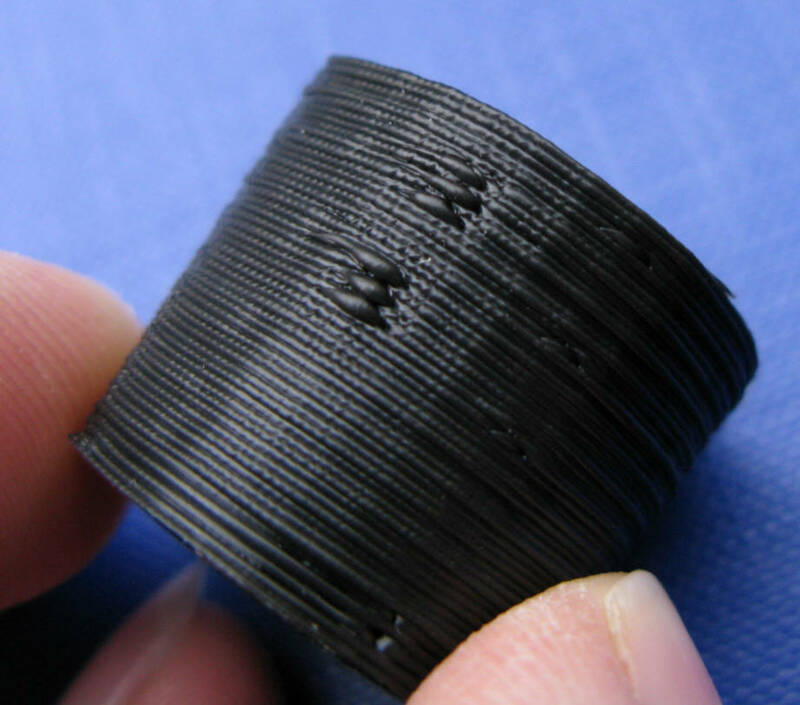 Have you tried any wider prints to see how warping is? > was not so good. Only a couple of hours actual printing with PP. Maybe half a day including trying to get a set-up that worked. I would be interested in a Blog of what works or not on the BfB extruder. 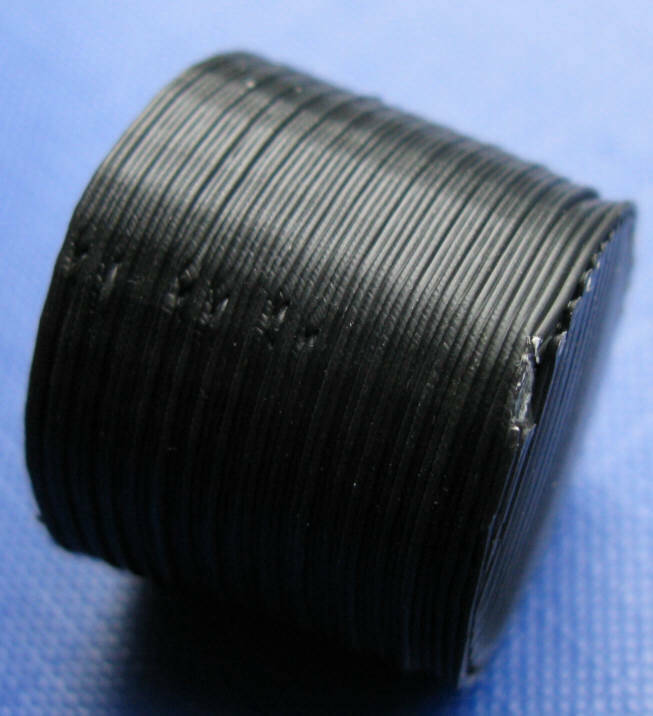 I'd also really like to see a wide range of plastics being supported by a RepRap. It really beats the hell out of the limited set of stratasys materials (al though you can order many colors and some variations, it's all very expensive). We'd still like try to replicate your rapid prototyping results. The extruder is a critical part for any fabbing, any I think many of us don't get it working satisfactory. I'm working with someone with a latte to produce an extruder with a shorter temperature gradient. Right now it seems that the filament gets stuck when it melts inside the PTFE temperature barrier. At that point my drive screw just eats away the filament until it no longer pushes it downward. I think I'm going to order PP too. The pictures from Tony surely don't get me discouraged! Besides, at some point with the recycling possibility it would be another free material that you essentially get for free with packaging (which would normally just add to our waste). Sorry for the slow response, all my spare time has been taken doing finishing touches to the firmware on the new V3 laser cut machine. Regarding the extruder, I will try and put a few notes together over the next few days and post on the builders blog. I have a requirement for a transparent material that does not have a low melting point. It is to replace a broken polycarbonate clip in a friend's lamp shade. 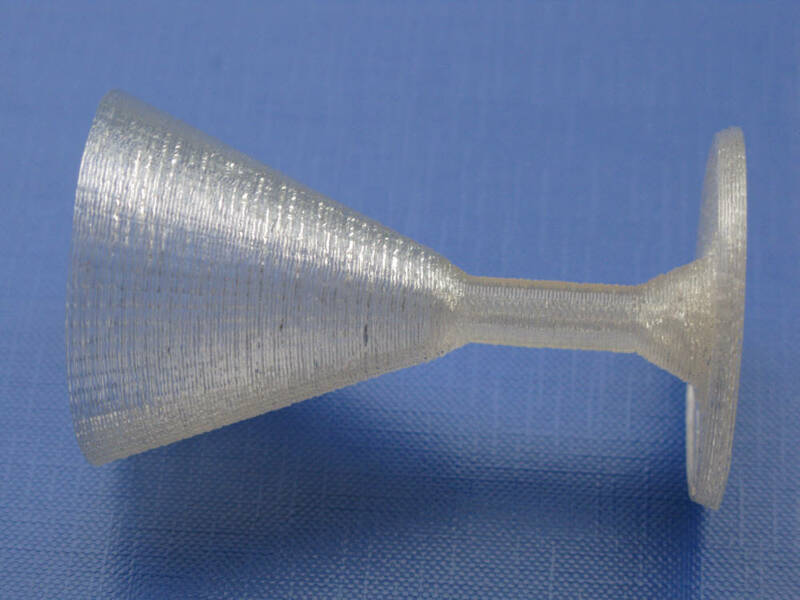 What form was your polycarbonate in? Is it flexible enough to spool or does it have to be rod? Did you get as far as making it to bond with itself? Edited 1 time(s). Last edit at 01/27/2009 05:20AM by nophead. > PLA for initial development. I really missed this before! Who did you buy your PCL from? Hi Chris, the PP and PCL both came from BfB, I am sure Ian still has both materials in stock. The PP is in 3mm filament x 100m coil. The material is very flexible and tough. As for getting it to bond with itself - have a look at the pictures I posted in this blog. You can just about see how the layers are melted together. The resulting mini mug is very tough, it will flex across the rim with a very tight squeeze. OK with that said, the mini mug was a one off, I ran out of room to print anything further. Since the mini mug I have tried to repeat the test and failed miserably. I got the temperature too low, the motor started and jacked the hot end off the extruder! Also worth a note is that the PP is like no other material I have tried, it seems to exhibit a lot of die swell and is a strange consistency when hot, almost rubber like in quality. Its worth doing a series of tests on this material to see what it takes to get a consistent filament. Your help would be appreciated. Chris, I have most of a 100m coil here, if you drop me an address off-line I will stick a few meters in the post for you to try. Thanks for the info and offer of PP. I will take you up on that, but it was actually PC (polycarbonate) I was enquiring about. I have no idea on how it bonds to itself. The filament is in a coil that fits into an A5 envelope so quite flexible. I only have the one length that will be run at some point. Let me know when you want to try the PP.